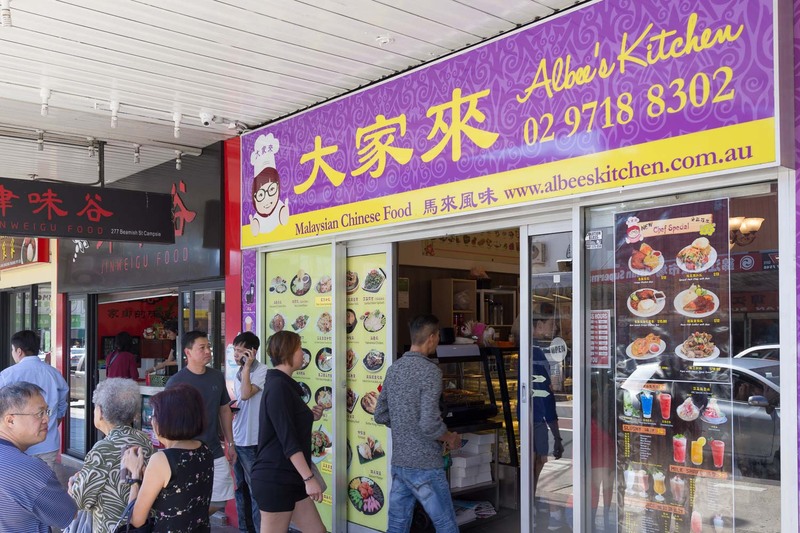 Albee's Kitchen is a long time Campsie favourite and one of our favourite Malaysian joints to boot. 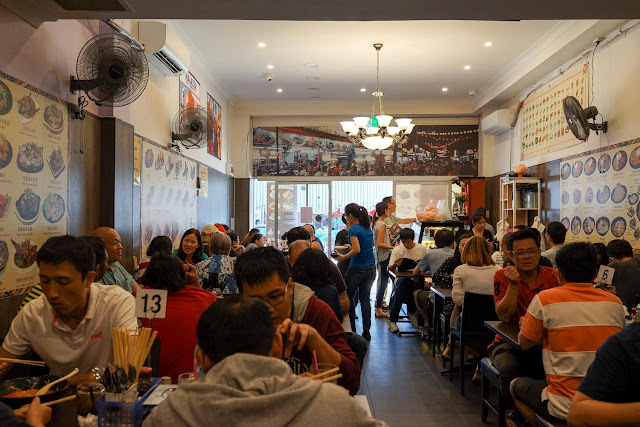 Albee's packed up their kitchen and moved across and down the street a couple of years ago, giving us a good excuse to head back and try our some favourites. Campsie on a weekend morning is busy and bright. There's plenty of action along Beamish Street, it's a high street that hasn't been lost to a major shiny new shopping centre opening up and destroying the small retailer, yet. It has had its ups and downs, stores come and go while the profile of the suburb changes. There's development at the bottom end of Beamish St and lots of new high rise along Canterbury Rd that could see further change. 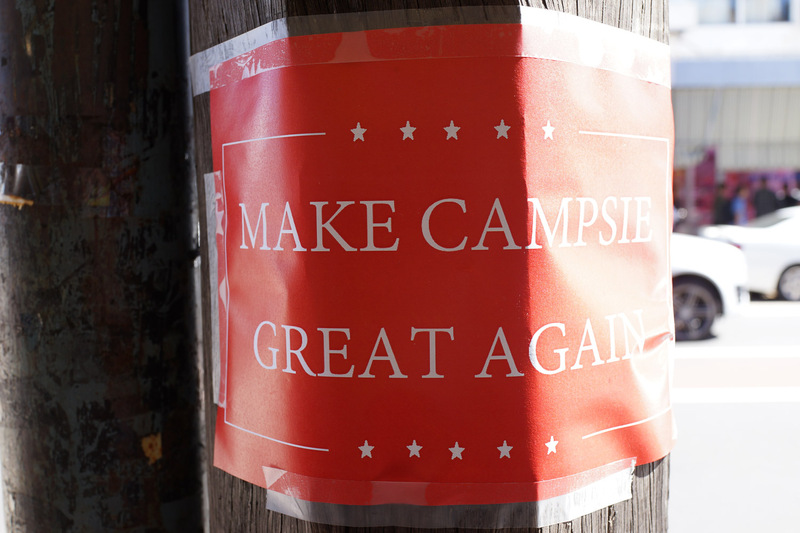 Will it make Campsie great again? It's bloody great now as far as we are concerned. Now for some great Malaysian food. The new Albee's location is a big square space. We loved the old joint where you walked out through the kitchen to the back rooms, but this space certainly gives more seating and is bright and new. When you walk in a snack bar full of ready made goodies tempts you. 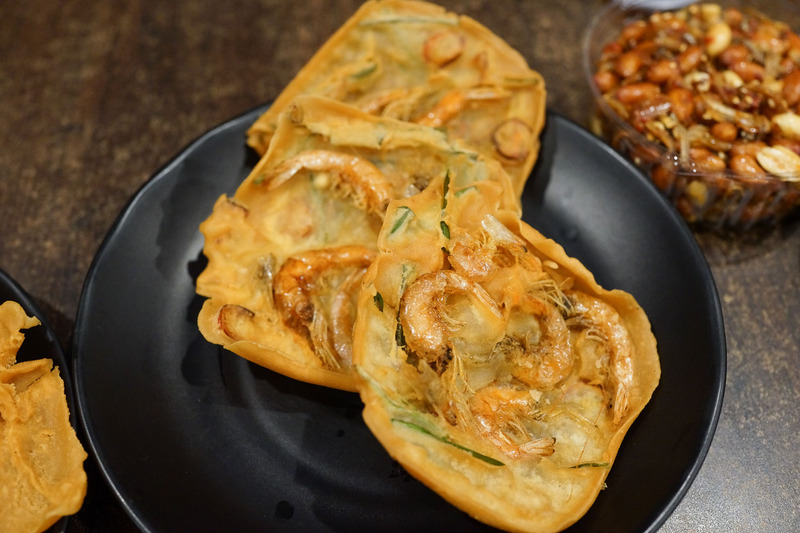 We eyed off these crisp prawn crackers on display, a mouthful of crunchy goodness. Don't worry about eating these whole small prawns, there's bucket loads of flavour in these little guys. 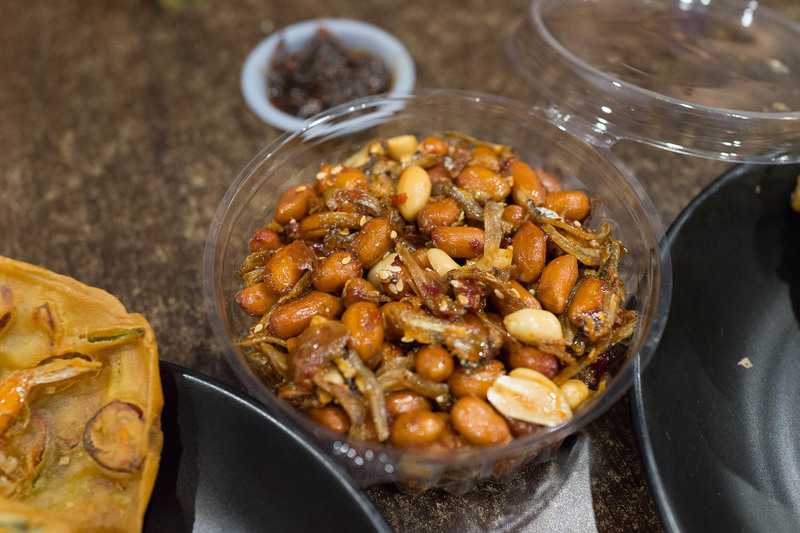 Sambal ikan bilis, a container to share on the table (and take home the leftovers) is $5.50. The rightly famous Karipap chicken curry puffs, $2.80. 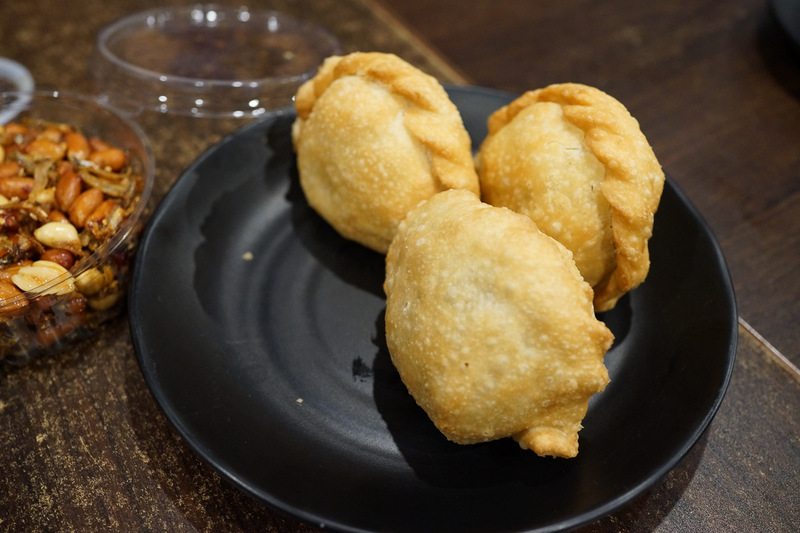 Each puff is filled with chicken curry, sweet potatoes, beans and a magic boiled egg. 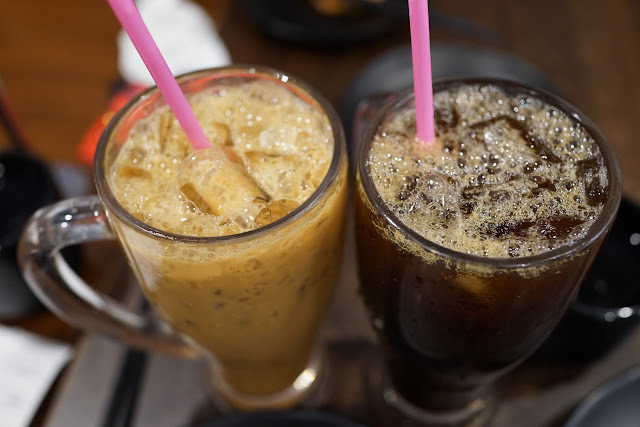 Cold iced tea or black coffees, there's a large range of tall and frothy drinks. You'll need to go to the pub for a different kind of tall and frothy. A simple won ton soup and a pork kolo mee. 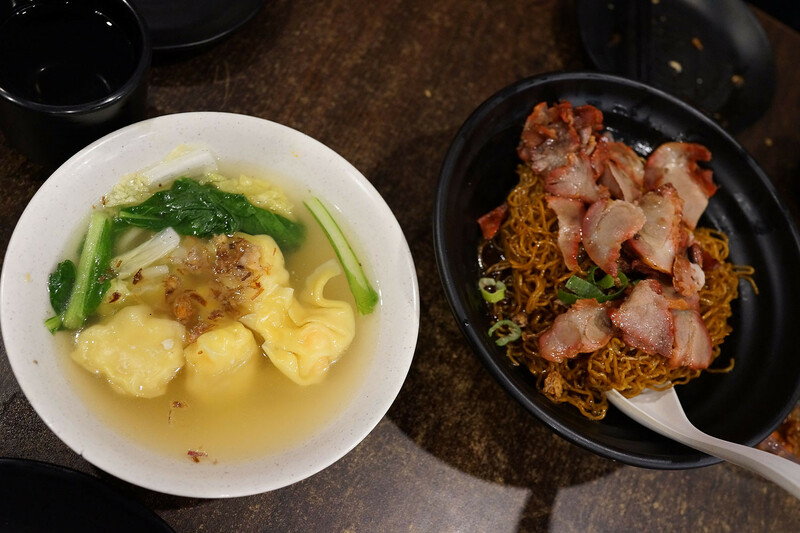 Kolo mee was a new noodle dish for us, a blackish sticky noodle base with slices of roast pork, something we will go back and try again. Multiple variations of this noodle dish are offered with a small side dish, either chicken curry, pandan chicken or sambal prawn looks good. 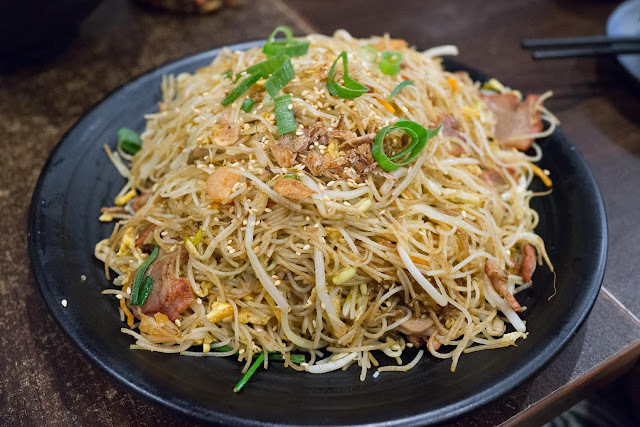 More noodles appeared on our table, we never knew who ordered these Singapore noodles but they were certainly simple and good. Salt fish and bean sprouts ($15.80) is a mountain of fried sprouts with flashes of strongly salty fish hidden inside. It's one of those dishes that looks deceptively plain, but each bite is a little treasure hunt when a piece of fish is included. Ngoh Hiang Lor Bak ($9.50 for one roll or $17.80 for two). 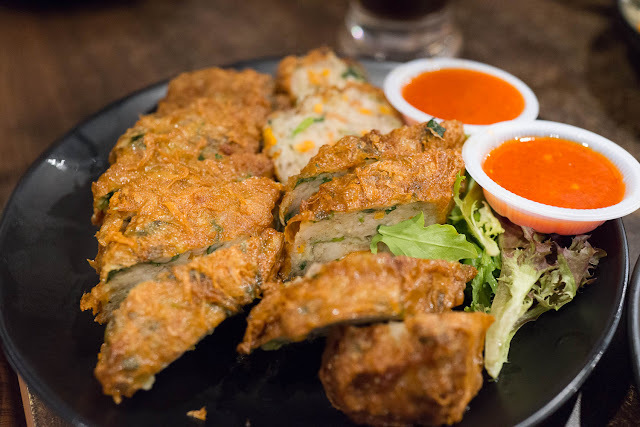 These crisp soy bean curd rolls are filled with seafood and minced pork. 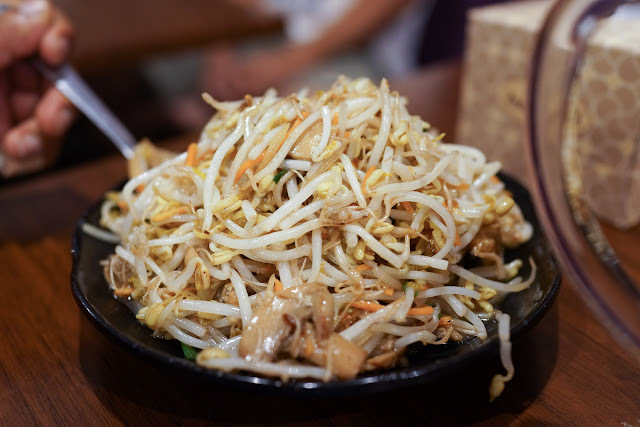 The soy bean outer goes incredibly crunchy when deep fried and the pre chopped roll is easy to share. Laksa Kuching Sarawak is a Friday to Sunday special worth making it for. 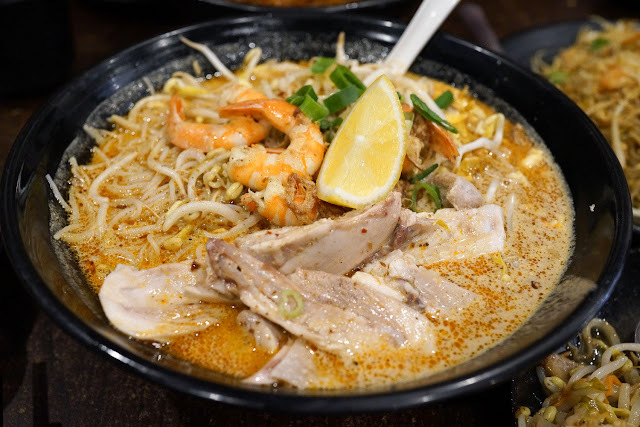 A different style of laksa with a deep prawn stock base and thin rice vermicelli noodles. 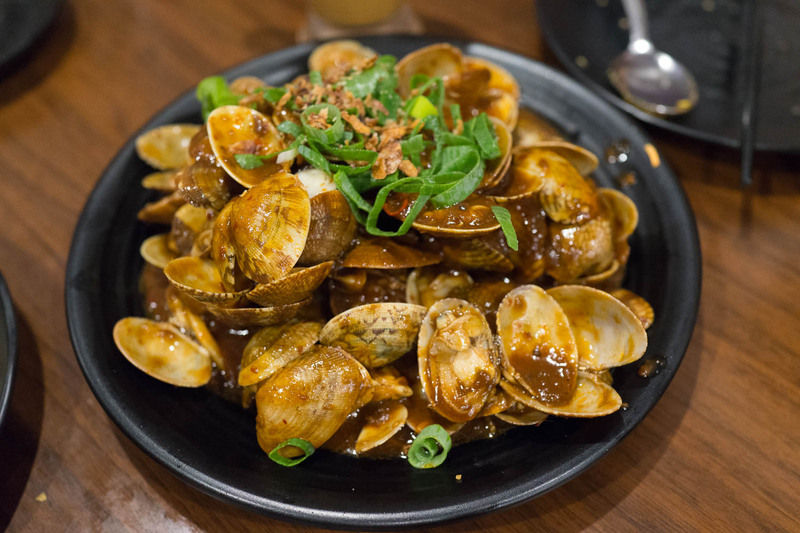 A plate of pipis with sambal for $18 helps slow down an eating frenzy. As each one needs to be eaten individually, the sauce licked off and the meat prised off, it makes it a good dish to pick over. 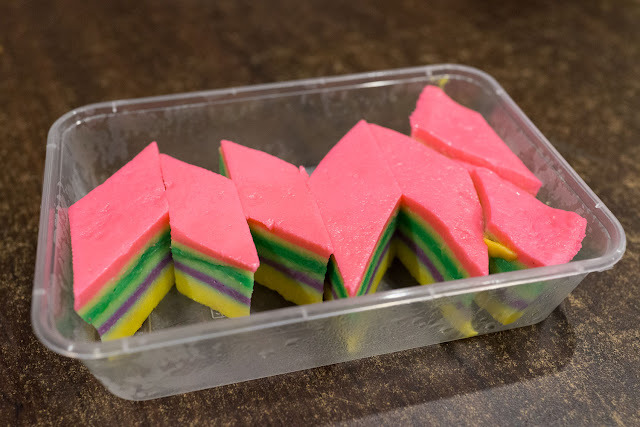 From the front counter, these rainbow kueh lapis were a happy end. These wobbly cakes are made with glutinous rice flour, coconut and eggs with different dyes for each layer. Finally, just when we thought we couldn't eat any more, we had to finish with an ABC Special (ais kacang). 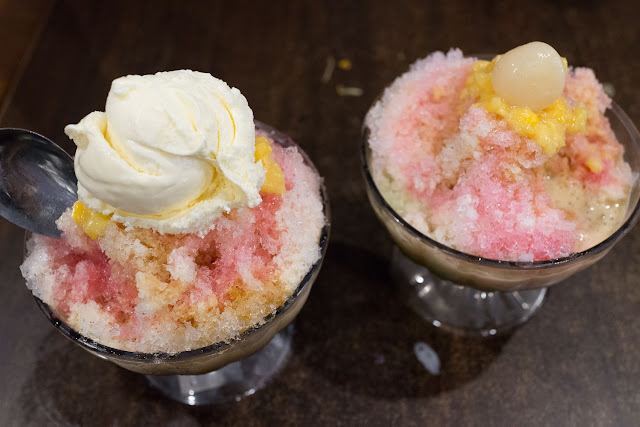 Loads of shaved ice, evaporated milk, grass jelly, corn, palm sugar syrup, red beans and even a scoop of ice cream or rambutan. Albee's Kitchen is at 279 Beamish St, Campsie. Ph: 02 9718 8302. M'sia. Some Kuih and kari-puff to tarpau (take away)? You betcha - think I'm bodoh as sotong (silly as a squid)? Where to know? Come, we go to Pau/Dumpling shop down the street to buy frozen ones to take home to Canberra.